In the new Trader’s Room version any link can be attached to the main banner, “Company’s website” button can be renamed and the necessity to agree with company’s documents during the registration can be made compulsory. Any link can be attached to the main banner. For example, you can inform the trader of the current special offers in details, introduce company’s news or just link the banner with the home page of your website. In Trader’s Room new version, you can rename “Company’s website” button at your discretion. For example, enter the link of your website “www.company.org” or write “Company’s official website”. In the new Trader's Room you can include the function of compulsory agreement with company’s documents during trader’s registration. This feature responds to the contemporary requirements of personal data processing in Europe for the international IT market (GDRP). Contact Sales Department for more details regarding UTIP Trader’s Room 2.1. Follow News on our website. New PSP RBK money has been integrated into the UTIP Trader’s Room. 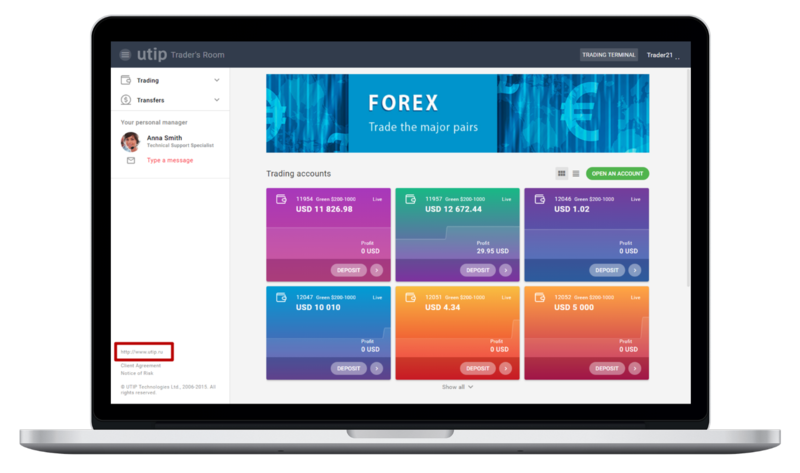 RBK money payment system remotely opens accounts for Forex brokers from any jurisdiction and does not require a Forex license. The company was founded in Russia in 2003. According to the representatives of the payment system, large broker Alpari is among its clients. The payment system allows to withdraw money from the merchant account to bank cards and bank accounts. For licensed brokers, the percentage for input / output of funds will be lower. RBK Money, Zotapay, PayAnyWay, MegaTransfer, Impaya, PaySeven, GoPay, Ecopayz, Cauri, OrangePay, PayBoutique and WinPay payment systems are plugged in the UTIP Trader’s Room for today. Follow the appearance of the new payment systems in News section on our website. All UTIP brokers can sell UTIP software to other brokers on the White Label terms and get more profit. White Label — is a program of cooperation, when broker-supplier (Prime Label) gives other broker-customer (White Label) trading platform for a certain cost and monthly commission from profit. All the brokers, who have purchased the UTIP platform, became Prime Label brokers. They have got the license to sell the software to other brokers on the White Label terms. Clients’ terminals for PC, Web, Mobile and iMac. Trader’s room and CRM system. For each White Label broker there is a separate server. We are going to install and set trading platform. For each Prime Label broker, we are giving a fixed cost for the software and fixed technical support fee. In turn, Prime Label broker can independently set the cost of selling the software, technical support and size of the commission. The whole amount that the Prime Label broker will earn "from above" remains at his disposal. To know more about White Label program, click the link. Follow all the news in the News tab on our website. © 2006-2019 UTIP Technologies Ltd.
UTIP Technologies Ltd. is developing the software and does not provide brokerage services and trust management services on the financial markets.